« Muglia Left After a Dispute With Ballmer on Cloud Computing? There is a bit of a joust on between Gartner, GigaOm, and likely others over the recent Gartner Magic Quadrant for Cloud Infrastructure. The Internet loves a good fight! Initially, it seems inconceivable that anybody could rank IaaS providers and not list Amazon Web Services among the leaders. Until, that is, one looks at Gartner’s ranking criteria, which is skewed against ever placing a pure cloud provider in that quadrant. Large web hosts and telcos certainly have a wider range of offerings and more enterprise-friendly service levels, but those aren’t necessarily what cloud computing is all about. Cloud IaaS is about letting users get what they need, when they need it — ideally, with a credit card. It doesn’t require requisitioning servers from the IT department, signing a contract for any predefined time period or paying for services beyond the computing resources. No collocation, dedicated nonvirtualized servers (often used for databases), or private non-Internet connectivity. The weakest cloud compute SLA of any of the evaluated competing public cloud compute services. They offer 99.95% uptimes instead of the 99.99% of many others and the penalties are capped. Support and other items are unbundled. Amazon’s offering is developer-centric, rather than enterprise-oriented, although it has significant traction in large enterprises. Its services are normally purchased online with a credit card; traditional corporate invoicing must be negotiated as a special request. Prospective customers who want to speak with a sales representative can fill out an online form to request contact; Amazon does have field sales and solutions engineering. Amazon will negotiate and sign contracts known as Enterprise Agreements, but customers often report that the negotiation process is frustrating. My first reaction to reading those negatives is they make a pretty good list of criteria for differentiating an old-fashioned managed hosting data center from a real Cloud service. Does Gartner understand what the Cloud really is, what it is about, and how to engage with it successfully? I dispute Derrick’s assertion of what cloud IaaS is about. I think the things he cites above are cool, and represent a critical shake-up in thinking about IT access, but it’s not ultimately what the whole cloud IaaS market is about. Eliminating Pure Cloud vendors from serious consideration. You must have non-Cloud offerings to play. Eliminating the self-service aspect of letting users get what they need, when they need it–ideally, with a credit card. Eliminating the possibility for self-service without a contract negotiation. Newsflash for you folks at Gartner: the Cloud is Not a Contract. It is a Service, but it is a not a legion of Warm Bodies. It’s not about sucking up with field sales and solutions engineering (“You’re a handsom and powerful man!”). I can understand that Lydia’s clients mention the need for elaborate contracts with detailed provisions unique to their circumstances. When that happens, and when it is so at odds with the landscape of a fundamentally new development that respecting it will prevent you from naming legitimate leaders like Amazon as leaders, there are two ways you can proceed. The easy thing is to cave to your clients since they’re paying the bills and concoct a scenario where the clients get what they think they want. The hard thing is to show some leadership, earn your fees, and explain to the client, or at least to the vendors slighted, why your recommendation is right. As I have already said, “The Cloud is not about contacts.” What it is about is commoditization through scale and through sharing of resources which leads to what we call elasticity. That’s the first tier. The second tier is that it is about the automation of operations through API’s, not feet in the datacenter cages. All the rest is hype. It is this unique combination of: scale, sharing of resources, elasticity, and the automation of ops through API’s that makes the Cloud a new paradigm. That’s how the Cloud delivers savings. It’s not that hard to understand once you look at it in those terms. A contract can destroy a Cloud’s essential “Cloudness”! I wanted to put that in bold and set apart because it is important. When you, Mr handsom and powerful IT leader, are negotiating hard with your Cloud vendor, you have the power to destroy what it was you thought you were buying. Your biggest risk is not that they will say, “No”, it is that they might say, “Yes” if you wave a big enough check. Those who have made the mistake of getting exactly what they want on a big Enterprise Software implementation that wound up going very far wrong because what you wanted was not what the software really did will know what I am talking about. Never sign a contract with your Cloud provider that interferes with their ability to commoditize through scale, sharing, and automation of operations. If they are smart, the Cloud provider will never let it get to that stage. This is one reason Amazon won’t negotiate much in a contract. Negotiating fees for services offered is fine. That does not interfere with the critical “Cloudness” qualities (I am steadfastly refusing the term Cloudiness so as not to deprecate my central thesis!). BTW, there are very close corollaries for SaaS, which is why they are also much more limited relative to On-prem vendors in what they can negotiate and why they try to hew to the side that Amazon has. This stuff didn’t get invented for Cloud or out of disdain for customers, there are real economic impacts. Let’s try a simple example. Your firm wants to secure Cloud resources from a provider who has some sort of maintenance outage provision for the infrastructure. It’s a made up example for Cloud (mostly), but is on point for SaaS and easy to understand, so let me continue. Your firm finds that maintenance window to be unacceptable because you have aligned your own maintenance windows with those of another vendor. If you accept the Cloud vendor’s window, you will now have two windows to present your constituents and that is unacceptable. So you want to negotiate a change in the contracts. Sounds very innocent, doesn’t it? I’ve been through this exact scenario at SaaS companies where customers wanted this to be done for the same legitimate and logical reasons. But consider it from the Cloud provider’s point of view. If they have a special maintenance window for you, they have to take a portion of their infrastructure and change how it works. Unless they have other customers that want exactly the same terms, they will have to dedicate that infrastructure to your use. Can you see the problem? We have now eliminated the ability to scale that infrastructure through sharing and scale. In addition, depending on how their automated operations function, it may or may not be applicable to your specialized resources. It isn’t just a matter of changing a schedule for some ops people–the automated ops is either set up to deal with this kind of flexibility or it isn’t. – You want to change the disk quotas or cpus on your instances. – Your SLA requirements damage some baked-in aspect of the providers automated ops infrastructure. This is easy to have happen. You insist on network bandwidth that requires a different switching fabric or whatever. – You want to limit how and when machines can be patched by the provider. – You want to put your machines on private subnets as Gartner suggests should be possible and has many who think the idea of a Private Cloud is Marketing BS decry. That list can be a mile long. When you get done ruling out all the things you really can’t negotiate without un-Clouding your Cloud, you’re going to see that relatively simple contracts such as you can already negotiate with Amazon are all that’s left. Congratulations! Unlike Gartner, you now understand what a Cloud is and how to take advantage of it. And remember, the next time you’re negotiating a Cloud contract, be careful what you wish for–you just might get it. Lydia Leong, one of the Gartner analysts who did the Magic Quadrant discussed here, has responded. I read her response as boiling down to agreement with a lot of what I’ve said, excusing the disagreements on the fact that the Magic Quadrant concerned both Cloud and Web Hosting and calling attention to Gartner’s plan to do a mid-year pure-Cloud Magic Quadrant. The latter is a good idea, and one would think had to be at least partially motivated by more negative feedback than just my own about this current Magic Quadrant. 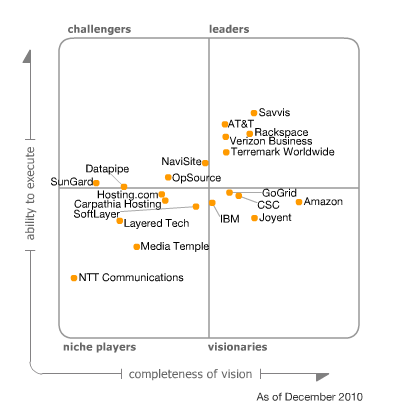 Try to compare Cloud vendors against Web Hosting vendors on the same quadrant is an apples-to-oranges exercise at best and misleading at worst. In any event, I thank Lydia for her gracious response and look forward to seeing the Cloud Pure Play Magic Quadrant. That’s where the meat will be! This entry was posted on January 12, 2011 at 5:00 pm	and is filed under business, cloud, data center, saas, service, strategy. You can follow any responses to this entry through the RSS 2.0 feed. You can leave a response, or trackback from your own site.